Pupils are joyful over the new classrooms turned-over to Katipunan Elementary School in Caibiran, Biliran. The P4M new 1-storey, 3-classroom school building will be occupied by kindergarten, grade 5 and grade 6 pupils. NAVAL, Biliran – The Katipunan Elementary School has now sufficient classrooms to accommodate pupils from kindergarten to Grade VI with the Department of Public Works and Highways (DPWH) Biliran District Engineering Office turning over new school building facility. 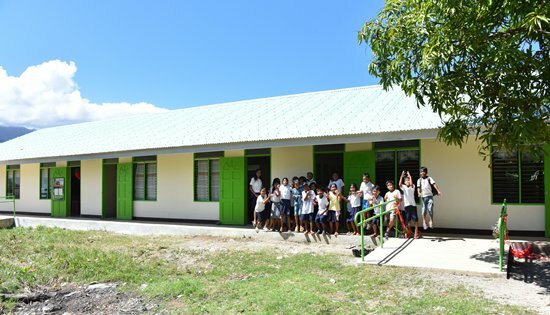 The completed 1-storey, 3-classroom school building worth P4M was turned-over on February 11, 2019. The event was graced by Congressman Rogelio J. Espina and Caibiran Mayor Eulalio G. Maderazo. DPWH-Biliran DEO was represented by Engr. Supremo Victor Sabitsana on behalf of District Engineer David P. Adongay Jr. The turn-over ceremony started with the ribbon cutting ceremony followed by the turn-over of the key of responsibility. Mr. Vivencio B. Dela Peña, School principal said that the new building would be occupied by kindergarten, grade 5 and grade 6 pupils. “Ngayun na occupied na yung bagong building, silang lahat andun na, so lahat ng kakulangan ng classrooms, complete na,” said Mr. Dela Peña. “Yung problema naming sa classrooms, answered na po,” Dela Peña added. According to Dela Peña, they are expecting more enrolees for the next school year with the addition of the new building in their school. Presently, Katipunan Elementary School has a total population of 186 students from 204 population in the previous year. “Hopefully with bagong building namin, siguro by next school year babalik na yung dati naming estudyante na nag transfer from other school kasi maganda na yung building namin,” said Dela Peña. “Salamat kay Congressman dahil ang kakulangan ng building sa aming school ay napunan na and also to DPWH for including Katipunan Elementary School as their recipient sa mga school na nangangailangan ng building,” Dela Peña added.